Color of Bloom: Purple Hardy Zones 4-9 Mature Height: 12-16" Months of Bloom: Summer Ships in 2 1/2" pots, and this is for 2 plants. LAVANDULA: An indispensable member of the herb family, used for perfumes and potpourri, its ornamental, compact habit along with gray-green scented foliage make it a welcome addition to the perennial border. Munstead Lavender is early blooming and fragrant. The plants are compact. Appearance: Lavender is a perennial evergreen shrub with narrow, silver, needlelike leaves on bushy plant up to 10 inches tall. The lavender-blue flowers appear in summer and stretch up about 6 inches higher. Growing Know-How: Plant in full sun and clean, well-drained soil 12 inches apart. Mulch with an inch or two of coarse sand. Give the plant time to reemerge in spring before trimming. 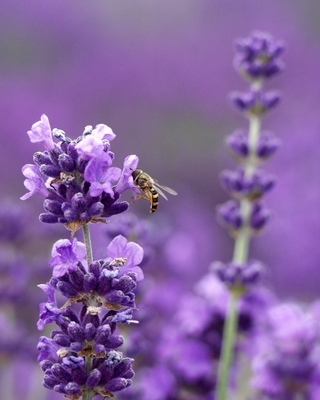 In areas with mild winters, you can shear growing lavender into a low hedge, knot, or edging. Remove faded flowers.